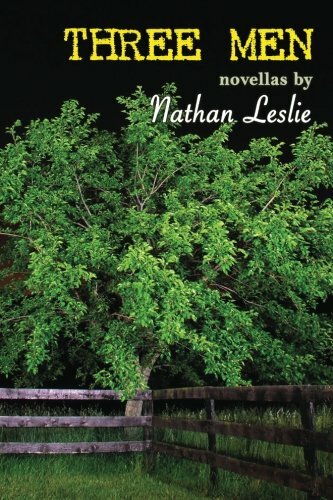 Reading Three Men by Nathan Leslie is so immersive, it is almost like living three lives. This trio of novellas is an exploration of three characters, each facing a moment of uncertainty in their lives. The collection is an intimate, at times uncomfortable but ultimately deeply satisfying experience. With an adept style and an incredible eye for detail, Leslie creates three believable characters whose experiences, while disparate, remind us of the constant struggle of being human. The three novellas each present a close character study of a different American man. In the first story, Sean begins a hitchhiking journey from California to the East Coast to see his mother. In the second story, Donnie goes on a vacation with his crumbling family while dealing with a psychological crossroads. In the third story, August continues his janitorial career with an eye on his distant troubled past. Nathan Leslie has picked the perfect form for his stories: the novella. In fact, this form allows the stories to delve a bit deeper into each character through a close third-person narration. This is a true “close third” narration – with each character we can feel their mental state shift from moment to moment. As Leslie himself acknowledges in his recent jmww interview, these stories are packed with character, rather than action. The stories are slow burners, with men who each creep towards their own revelations. The way the characters undergo or prepare for change in each of the stories is undeniably authentic. These changes do not feel forced or Hollywoodized. They offer small moments with big implications. Certainly, part of the way we get to know these characters is through their thoughts. The thoughts are constant, and since we are in third person, the thoughts often bleed with or obscure reality. But I would argue that one of the most interesting aspects of Leslie’s writing is his ability to craft character through a literal view of the world. Leslie does not just write “trash,” or even just list a few things. He gives us everything, and this is because we are seeing the world through Sean’s eyes. And indeed, this detail continues. Donnie, for instance, has a fixation on moles: we learn that he constantly notices them in the world, and that he is looking forward to a “beach mole hunt” on his vacation. August’s story begins with a close up of his job, a detailed description of each step and motion in filling a bucket, putting on gloves and getting ready for work. The incredibly beauty of Leslie’s writing is that it can be so mundane, and yet also so full of meaning for his characters. Donnie’s mole obsession gives us an immediate sense of his obsessive character, and when he chooses not to notice the moles, we know that he must be on the cusp of change. August’s eye for detail and presence in his job shows his maturity, which has come only from the wisdom brought by a troubled past. There are times where the closeness of the third person becomes almost claustrophobic; we are with Sean in the car of a man who is evidently a bit unhinged; we are in Donnie’s mind as he mulls over the concept of nostalgia, the decay of society; we are running over August’s troubled past, again and again, while he cleans the church, room by room. For me, Donnie’s story in particular was difficult to stomach in the beginning, because we are living in the mind and body of a person who is swinging between indifference and deep unhappiness. At the same time, the novella form gives the reader a chance to really know these characters. It gives space to the changes that are occurring, and in many ways these changes are much more real than many slower moving short stories can hope to be. Donnie’s transformation, in particular, is incredibly satisfying. It is like a storm, looming and in the air, then all of the sudden there and undeniable. And these changes – the shifts in the main characters’ understandings of secondary characters or sudden presence in a place – are small but also profound. These three stories are not a series. They, like men who live in the same country but never cross each others’ paths, do not rely on each other’s existence. And yet, together they are affirmations of each other because they remind us of the humanity and complexity that exists everywhere. Leslie’s adept development of character shows us that Three Men could be anyone, because everyone has a story. There is a sense that Leslie could make a story from any person or even any moment, since each moment is full of living, full of seeing and feeling and struggling to make sense of things.